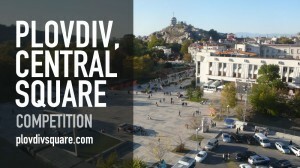 WhAT Association has just launched an open architectural competition for concept design of the Central Square of Plovdiv (Bulgaria’s second biggest city). The Municipality of Plovdiv and One Architecture Week Bulgaria would like to invite worldwide architects to participate. The competition is to outline the future of the Central Square in Plovdiv—an emblematic location where you can find archaeology, a socialist mastodont Post Office Building and overlapping traces of most of the significant historical periods of the city. A solution for their untroubled co-existence is yet to be found. The competition is international and anonymous. Eligible for participation are architects or teams with at least one member who is an architect and in legal capacity to practice architectural design. Competition projects are expected by June 20. An international jury, comprising the architects Saša Begović, 3HDL (Croatia), Jeroen Zuidgeest, MVRDV (The Netherlands), Elena Arguirova, Olivier Gahinet Architecture (France), Ljubo Georgiev, Director of One Architecture Week (Bulgaria) and representatives of Plovdiv Municipality will select the best as of end of June.